When it comes to NYC living creating a space is a unique experience since so many floor plans are determined by their owners. These NYC condo pictures feature an architectural wonder created by Steve Blatz and featured in Interior Design magazine. 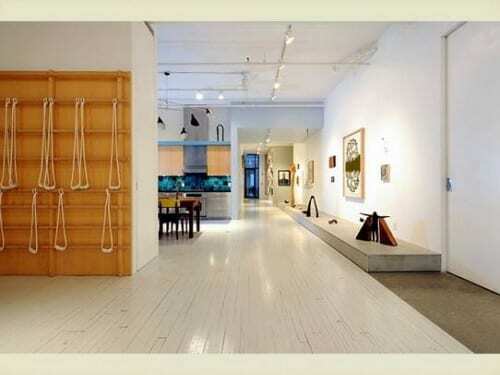 The property is located at 14 East 33rd Street and is designed as a working and living space. Total square footage is 4,444 with 4 bedrooms, 2 bathrooms, and 10 rooms total based on the clever setup of interior walls. The first design element to grab my intention is the interior walls. The walls are free standing and cleverly placed to divide up space into living and work sections. The decorative walls are constructed of bands of ash wood. The effect infuses Japanese architectural influence into the overall design which creates a unique experience as you go visually from room to room through the condo. Furniture is well placed throughout the home and not overpowering supporting the open space interior design theme. Other features of this NYC condo include: 12.2 tall ceiling heights, 50 foot window walls on front and back with a bay window in the living room, and a 6 x 37 foot terrace. Price: $3,000,000.